2 pounds potatoes, washed, peeled and sliced in halves. I used medium-sized Russet potatoes. You can also try red-skinned potatoes. 1 bunch scallions (about 6 scallions), chopped. I did not buy scallions so I used a handful of fresh arugula. Add water to a large (4 qt) saucepan and heat on high. Add potatoes and a dash of salt. Bring to a boil and simmer until potatoes are soft, about 20 minutes. Drain potatoes and let cool. Transfer potatoes to a large bowl and mash. Place salmon on a lightly oiled rimmed baking sheet and season with salt and pepper. Bake for 12 to 15 minutes until the salmon is medium-rare inside. Meanwhile in a large skillet, heat 1 teaspoon oil over medium-high heat and saute the onions until soft about 5 minutes. Add garlic and saute another 1 to 2 minutes. Then remove from heat. Flake the salmon and add it to the mashed potatoes. Add the onion and garlic saute, arugula (or chopped scallions), eggs, ginger, soy sauce and sesame oil. Mix well, then fold in the bread crumbs. Season with salt, about 1/4 teaspoon. Form into 1/2-cup patties. In the same skillet where onions were sauteed, add enough oil for frying, about 2 tablespoons and heat to medium-high. Working in batches, fry the potato-salmon cakes until browned and crisp about 3 minutes per side. Add more oil as necessary for remaining potato-salmon cakes. Transfer the cakes to a large baking sheet and bake until heated through, 15 minutes. Serve with Dill Sauce. 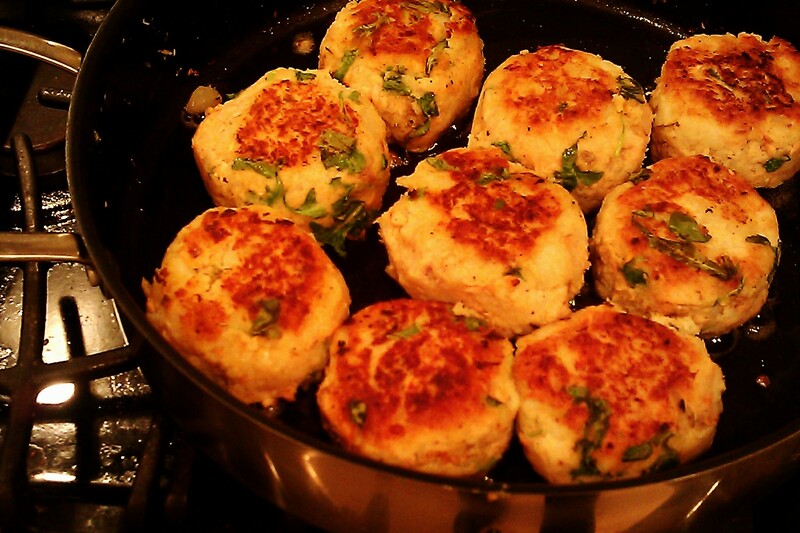 The measurements are enough for about a third to half of the potato-and-salmon cakes. In a small bowl, combine all the ingredients well. Refrigerate any leftovers. Oh! They look lovely and yummy! Those look wonderful. I especially like the dill sauce. I never would have thought to add potato to the salmon cakes although it really sounds so much better than just plain bread crumbs. Thanks! I wish I had snapped a photo of the cakes smothered in dill sauce. Could make for a nice Sunday breakfast too with an egg on the side … hmm, thought of it just now. Terrific idea. I like that too. Thank you, they were especially with the dill sauce. Fresh dill is definitely preferred but organic dried dill worked really well for the sauce.